The SGC develops the X-301 Interceptor, an experimental hybrid craft made from two captured Goa'uld death gliders. 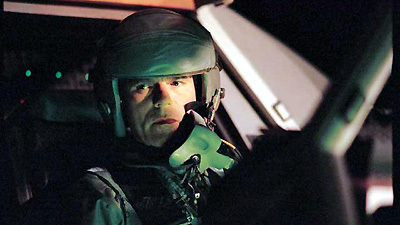 However, during its test flight, a hidden Goa'uld device causes O'Neill and Teal'c to lose control of the craft, and sends them hurtling into space. Carter and the SGC desperately try to find a way to return the ship to Earth, but when an attempt to slingshot around Jupiter fails, and the craft is further damaged in a collision, the situation looks hopeless. Daniel tries to contact off-world allies for help, and learns that the Tok'ra have a single ship within range, but it is engaged in a covert mission in Goa'uld territory. Carter and Daniel gate to that region of space, hoping to intercept the Tok'ra ship, and are surprised to discover that the Tok'ra operative they are seeking is Jacob Carter. When Jacob learns of the situation, he abandons his mission, and with his help, Carter and Daniel race across the galaxy, hoping to reach O'Neill and Teal'c before it is too late. As the X-301 streaks toward the edge of the solar system, O'Neill and Teal'c try to conserve their resources in the faint hope of a rescue. Jacob's ship is barely able to rendezvous with the disabled craft in time, but O'Neill and Teal'c are already suffering from oxygen deprivation and the deep cold of space, and are barely conscious. With only moments of oxygen remaining, they coordinate a daring rescue. O'Neill and Teal'c must enter the emptiness of space in order to be transported aboard the safety of the Tok'ra ship. The X-301 Interceptor is a hybrid craft made with American design and two Goa'uld death gliders recovered two years ago. It was intended as a platform from which to launch an attack against a Goa'uld ship. The power source doesn't exert force against gravity so much as take inertia out of the equation, making even pilots immune to G-forces. It is equipped with stealth technology and two AIM-120A air-to-air missles that could destroy a Goa'uld mothership if armed with a naquadah-enhanced warhead and modified with a shield-frequency modulator. The gliders contained a recall device designed to return them to Apophis's homeworld, sending the ship into space at a million miles per hour on a trajectory out of the solar system toward the Oort Cloud. P2C-257 is a Goa'uld-occupied world within a scout ship's range of Earth. SG-14 had spent several days there observing a Goa'uld mining operation. Jacob was on a covert mission there when Carter and Daniel found him. Beam them out. What am I, Scotty? Mak tal shree! Lok tak. Mekta satak Oz! Mok tal Oz kree!